Ben Maher (GBR) looks to be on phenomenal form this season, notching up yet another CSI5* win, this time with the Poden Farms owned Don Vito, as the action gets underway at the Longines Global Champions Tour - Longines Paris Eiffel Jumping. Uliano Vezzani There were plenty of options in the second phase, offering riders the chance to ride slow and secure, or take a chance to better their time. With this, the first class of the weekend, many took the chance to flex the muscles of their horses, putting in confidence building rounds without putting the pedal to the metal. Kel'Star du Vingt Ponts and Sergio Alvarez Moya (ESP) with MHS Attraction amongst those looking on strong form. Also looking interesting for the weekend ahead were some of those who took a steadier first phase, with Scott Brash (GBR) and the 9 year old Hello Jefferson, Beezie Madden (USA) with Coach, Gregory Wathelet (BEL) with Coree, Olivier Philippaerts (BEL) with Extra, Bertram Allen (IRL) with Hector van d’Abdijhoeve and home favourite Simon Delestre (FRA) with Hermes Ryan also jumping clear but picking up one time fault. But it was Maher who took the first win of the weekend, with the eye-catching chestnut Don Vito cruising around the arena to stop the clock in 19.79s, two tenths of a second faster than Philip Houston (GER) and his top horse Loewenherz. Third went to Marlon Módolo Zanotelli (BRA) with Typie du Tillard, with fourth going to Nayel Nassar (EGY) with Lordan. 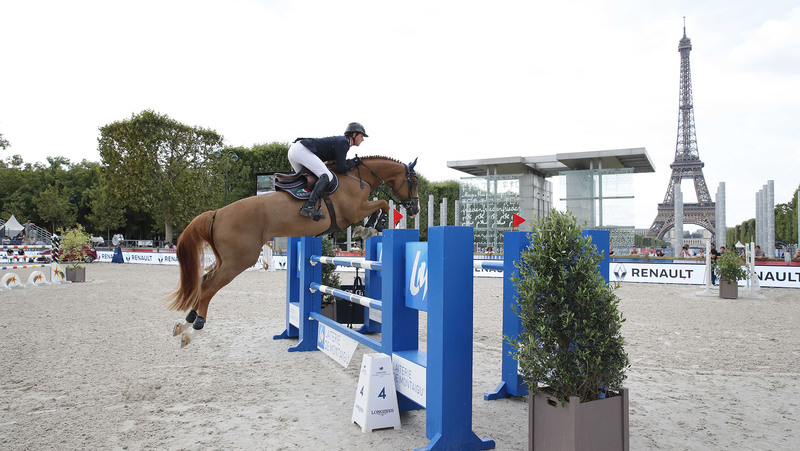 The next class, the GCL Paris first round kicks off at 17:00 local time, with the teams lining up to fight for pole position and the smallest score possible heading into Saturday’s final. Later in the day Henrik von Eckermann (SWE) with Flotte Deem took the CSI5* Six Bar win, with the final jump at an incredible 2.11 metres. Von Eckermann just pipped popular French rider Julien Epaillard to claim the top prize, with Christian Ahlmann (GER) and Atomic Z in third and Jos Verlooy (BEL) rounding out fourth with Japatero VDM as the sun threw its golden light across the arena.